I recently discovered Cupcake Organic Divine Skin Care products and they very kindly sent me a moisturiser to review. Firstly, let me share with you some product information. 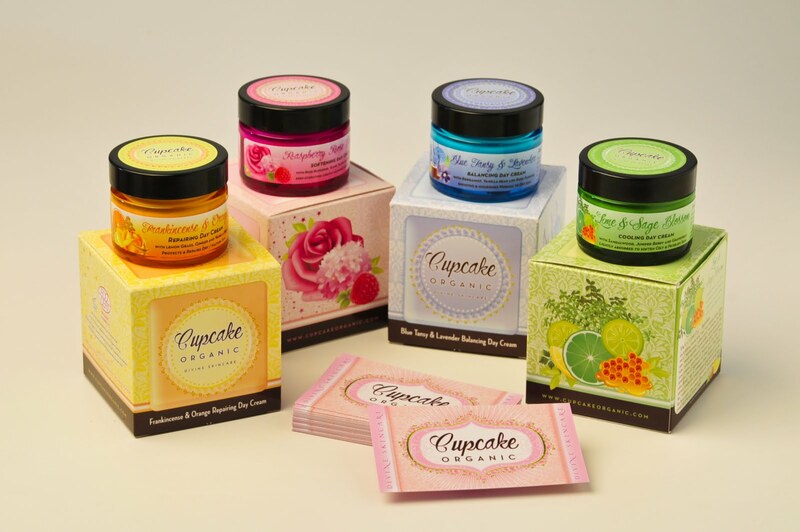 Cupcake Organic creams carry the ECOCERT® label and are free from chemical nasties (i.e. parabens, mineral oil, SLS, silicones, petrochemicals). These creams do not contain animal products making them suitable for Vegans and Vegetarians. There are four creams in the range - Raspberry Rose Blossom Softening Day Cream, Blue Tansy & Lavender Balancing Day Cream, Frankincense & Orange Repairing Day Cream, Lime & Sage Blossom Cooling Day Cream. The variety of creams means they cater to many skin types. I did request to try the Blue Tansy & Lavender Balancing Day Cream as I felt this was the one which would be most suited to my skin type. This particular cream is described as "Balancing Day Cream with Bergamot, Vanilla Bean and Rose Flowers smooths & nourishes Normal to Dry skin. Lightly absorbed into all skin types to balance and smooth skin." As you can see from the picture the packaging for these products is beautiful. The blue coloured glass jar (30ml) comes in a co-ordinating coloured box. I know the product is the important part but attention to detail on packaging is always an added bonus. I have been using this product for over two weeks morning and night, now normally I would wait a little longer before I judge a product but honestly this cream was amazing from the first application. The fragrance is very natural and not over powering, to me it smells herbal rather than floral. The texture is light but feels luxurious on the skin. You need to give it a few seconds to absorb before applying make up but my skin never feels greasy just nourished and pampered. I found a little goes a long way and I can see that this jar would last me for a few months. Personally (and I am not being paid to say this) I want to shout from the roof tops about this product. I do not mean to brag but my skin is glowing and the condition has improved. My skin stays hydrated for the entire day which I am thrilled about because no more dry patches means my make up is easier to apply. Overall, it is a big Sugarpuffish thumbs up from me. To quote the company “The products of Cupcake Organic also make simply beautiful gifts! Our special "cupcakes" not only look beautiful, but they will make you feel beautiful as well!” - I totally agree. If you would like to purchase these products a jar costs £16. Disclaimer – I was sent this product free of charge, all opinions are my own and I am not being paid to do this review or to promote the website/product. New GFC follower from the Social Parade! Found you through a blog hop. Come visit mine!